No you need another code to write for the extension blocks. 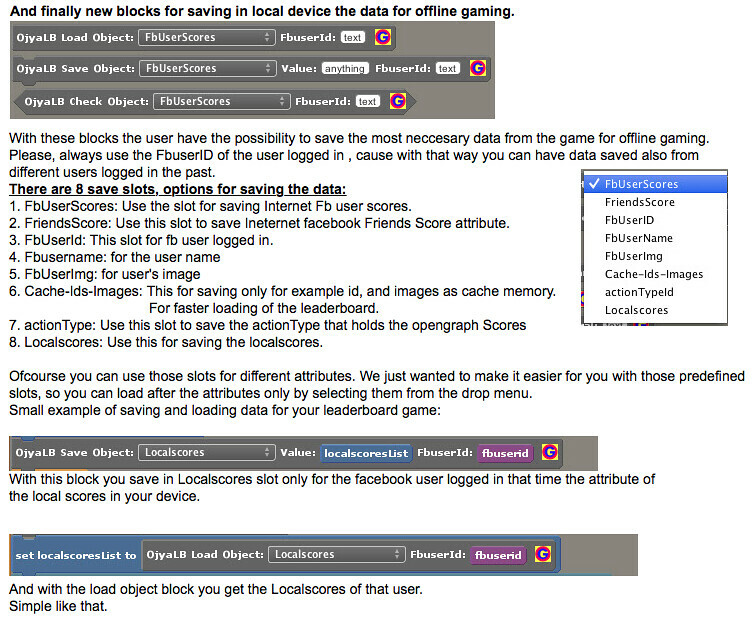 With a Stencyl HTML game , you have to use Facebook HTML blocks . Stencyl can do it. I developed a game in the beginning like this. But to take the token you need also an php site for your game . A lot of different work. But can be done. Visit our site to see tips of how to use the latest feature like Opengraph Scores. Remember if you create a Facebook game and you have all the values taken from the Facebook site of your game , as we tell you in the tutorial then make work the leaderboard is Plug and Play. Ofcourse the sample game is just an example of how to use the information and programming tips to build your own Facebook leaderboard or simply modificative ours on your needs so to save up time. Having difficulty with the very first step. Sending you a message now. Please check your email and respond asap. New tutorial on our site for understanding how the sample leaderboard game works. Will help you build yours or modificate ours using the extension. New instructions for downloading inthebox-macros also for Xcode 7 and Mac OS El capitan. Go to our site , section Installation. Thanks Andrea , this is great. Works really good. New Youtube video of the new Post Challenge block of our Extension. New section "Use OpenGraph Scores" on our site for how to use the block OjyaLB OpenGraph Scores for posting scores to Facebook. Also updated section "USE OF THE EXTENSION". New update with blocks for offline gaming and also updated our sample game-leaderboard. Those blocks permits you to have 8 saving slots for really quick saving and loading data to your local device. Useful for offline gaming when the Facebook connection is not available. Please, visit our site http://ojyagames.byethost12.com at the section on the left "Use of the extension". Thank you Jon and Justin for putting the Ojya Leaderboard extension as part of Stencyl's Extensions ! For a limited time we offer extension and Leaderboard sample game for 9 euros!!! Site update instructions for downloading libraries like inthebox-macros in a Windows OS. Please visit our site http://ojyagames.byethost12.com at left section "Installation". Has this one been updated to 3.4? First post says it has been tested 3.4.0. I say it should work with the beta 2 as well.